Deep in a quadrant of space believed to be empty, a virgin, unexplored planet has been discovered by three unique, powerful species. The resources of the planet are abundant beyond belief, but are protected vigorously by the indigenous species, known as the Trogs. The riches of the planet will be won, inch by inch, with blood. 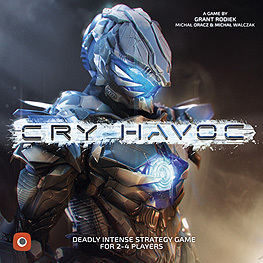 Cry Havoc is an asymmetric, card driven area control game for 2-4 players. Each player controls one of the four unique species and fights viciously to gather the most resources on the planet. Players customise their decks of cards, build powerful structures, and leverage their unique Skills to become victorious. Your forces are represented by 52 high quality miniatures for four species: Pilgrims, Humans, Machines, and Trogs. Control regions to harvest the crystals. Capture prisoners in battle. Leverage your unique skills. Do you take control of the territory? Capture prisoners? Or just scorch everything? Every battle forces you to choose which objectives are most important. CONTENTS: 20 Skill cards (44x68mm), 64 Tactics cards (63x88mm), 6 Event tokens, 12 Exploration tokens, 12 Trog Nest tokens, 18 Trog Warparty tokens, 8 Battle tokens, 1 Action marker, 4 HQ tokens, 14 Structure tiles, 46 Structure tokens, 3 Artillery tokens, 3 Watchtower tokens, 32 Control tokens, 5 Scoring Enabled tokens, 4 Score tokens, 8 Initiative tokens, 52 Unit miniatures, 50+ plastic Crystals, 1 main board, 4 Faction boards, 1 rulebook.